SAVANNAH, Ga. – The U.S. Army Corps of Engineers J. Strom Thurmond Lake Office will open the following campgrounds for the 2014 recreation season on the dates listed below. All campground reservations can be made by calling the National Recreation Reservation Service toll-free at 1-877-444-6777 or online at www.recreation.gov. Petersburg Campground, Columbia County, Ga. Sites 1 – 27 open year-round; sites 28 – 93 open seasonally from Feb. 28 – Sept. 28. Address: 3998 Petersburg Road, Appling, GA 30802. Phone: (706) 541-9464. Petersburg Campground is a wooded, waterfront facility with 93 sites, most with water and 20/30/50-amp electrical hookups. Amenities include flush and vault toilets, showers, drinking water and a dump station. The campground also includes two swimming beaches, a playground, boat ramp, fishing dock, fishing pier, access to a 27-mile hiking trail, a pond and a first-come first-served picnic shelter is located on-site. Bussey Point Campground, Lincoln County, Ga. All sites open year round. This campground is located at the entrance to the Bussey Point wilderness recreation area, a 2,545 acre peninsula on J. Strom Thurmond Lake. The campground provides 14 lakeside primitive campsites without water or electricity, however all have picnic tables, fire rings, and grills located at each campsite. In addition, all 14 campsites are capable of accommodating campers with horses. There is also a boat ramp, two hand pumps for drinking water, and rustic toilets located throughout the area. The wilderness area provides multi-use trails that offer the visitor a relaxing getaway for nature viewing, hiking, mountain biking, and horseback riding. Big Hart Campground, McDuffie County, Ga. Open March 28 through Sept. 28. Address: 5258 Washington Road, Thomson, GA 30824. Phone: (706) 595-8613. The campground has a total of 31 sites, most of which are waterfront, all with water and electric 20/30/50-amp hook-ups. Other amenities include flush and vault toilets, showers, drinking water, a dump station, playground, beach, boat ramp and dock. The campground also provides a group camping area. The group area has a shower and restroom facility, 7 campsites with water and (50-amp) electricity, and a centrally-located picnic shelter with a grill. Hawe Creek Campground, McCormick County, S.C. Open March 28 through Sept. 28. Address: 1505 Chamberlains Ferry Road, McCormick, SC 29835. Phone: (864) 443-5441. This campground contains 34 sites, most of which are on the waterfront. Water and 20/30 or 20/30/50-amp electrical hookups are provided at each site. Other amenities include flush and vault toilets, drinking water, showers, dump station and a boat ramp for campers. Modoc Campground, McCormick County, S.C. Open March 28 through Sept. 28. Address: 296 Modoc Camp Road, Modoc, SC 29838. Phone: (864) 333-2272. This campground, made up of two peninsulas, contains 69 sites with water and electrical hookups (20/30/50-amp) and 1 primitive site with no electricity. Other amenities include a boat ramp, playground, flush and vault toilets, drinking water, showers, laundry facilities and a dump station. Ridge Road Campground, Columbia County, S.C. Open March 28 through Sept. 28. Address: 5886 Ridge Road Appling, GA 30802. Phone: (706) 541-0282. This wooded, waterfront campground has beautiful views of the lake. It contains 63 sites with water and 20/30/50-amp electrical service. Six sites are set aside for primitive tent camping. Amenities include flush and vault toilets, showers, drinking water, laundry facilities and a dump station. Also, a playground, boat ramp, dock and fish cleaning station are located on-site. 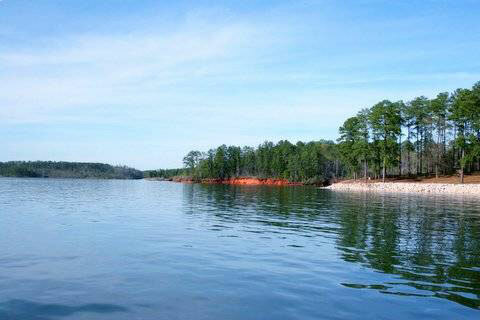 Winfield Campground, McCormick County, Ga. Open March 28 through Sept. 28. Address: 7701 Winfield Road Appling, GA 30802. Phone: (706) 541-0147. This waterfront campground contains 80 sites with water and 20/30/50-amp electrical hookups. Amenities include a dump station, flush and vault toilets, showers, drinking water, a playground and a boat ramp. Lincoln County, Ga. is in the process of leasing Clay Hill, Broad River and Hester’s Ferry campgrounds. For 2014 opening/closing dates and reservations, contact Lincoln County at http://www.lcgagov.org/reservations.html or (706) 359-4444.